Hello friends! I hope you all had a fantastic weekend. Ours’ went by in a blink of an eye…we’re just trying to cram too much fun AND work into the weekends, and Monday rolls around way too quickly. 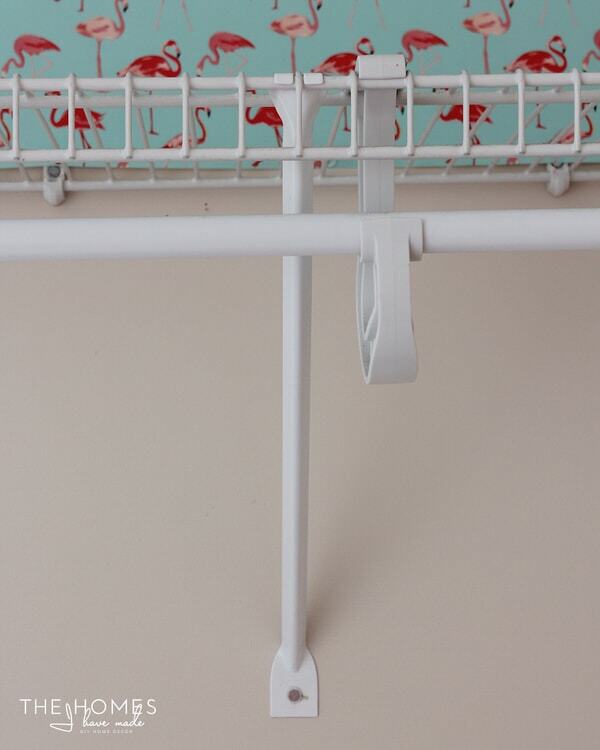 But I’m kicking off the week with the much anticipated tutorial on how I hung the flamingo wrapping paper as wallpaper in our laundry room, which is a pretty great way to start a Monday, don’t you think?! Let’s dive right in! 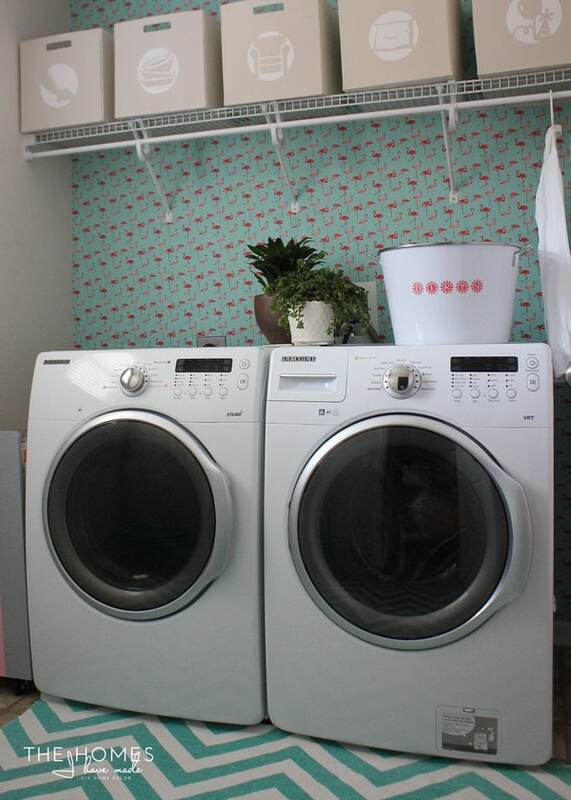 Last week, I showed you guys my quick and easy laundry room updates, and I was so excited to hear read that you guys love the flamingos on the wall as much as I do! It was a relatively easy $10 project that certainly provides the major wow-factor in the room. It was a huge whim, but it totally paid off. As a result, this room is just the cheeriest, happiest place to be! Hanging wrapping paper on the wall isn’t exactly new around the blog-o-sphere or here on THIHM. 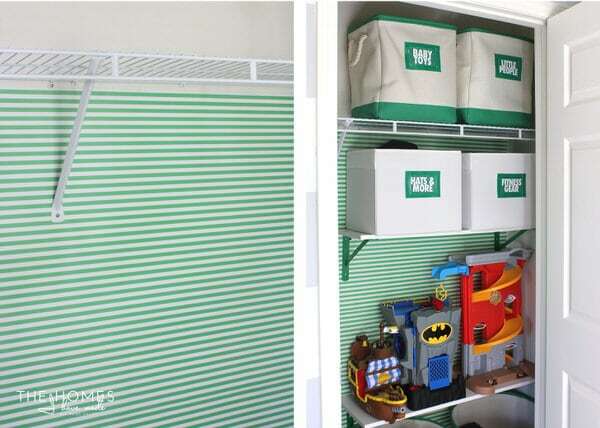 In our last home, I papered our front hall/toy closet with a preppy green and white stripe. 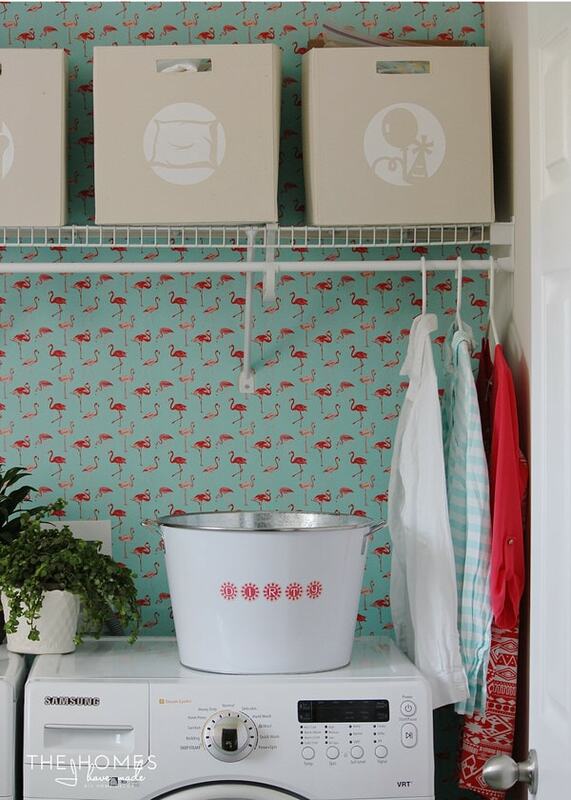 Like pretty drawer liner, paper on the back wall of closet just adds an extra pop of fun and color to an otherwise boring space! 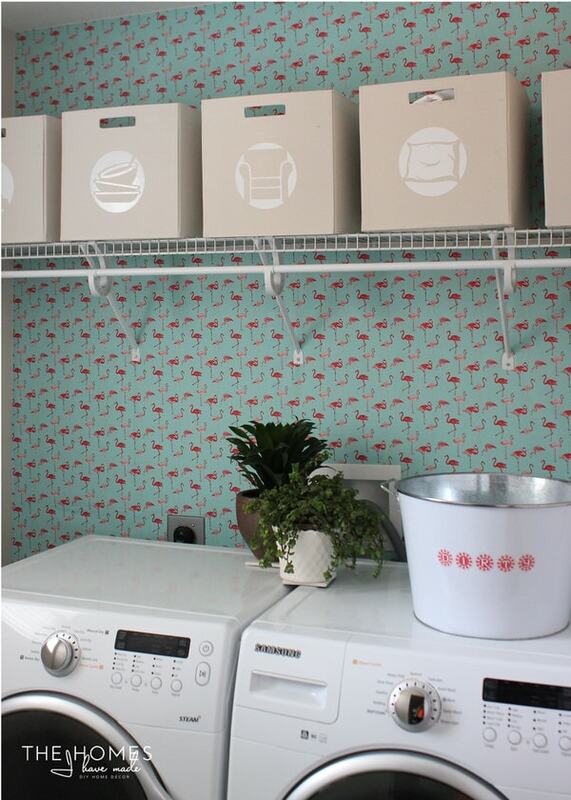 Like I’ve mentioned here and there, the laundry room was never intended to receive a makeover. But when I stumbled upon the flamingo wrapping paper at TJMaxx, my mind instantly started racing on where I could put it. 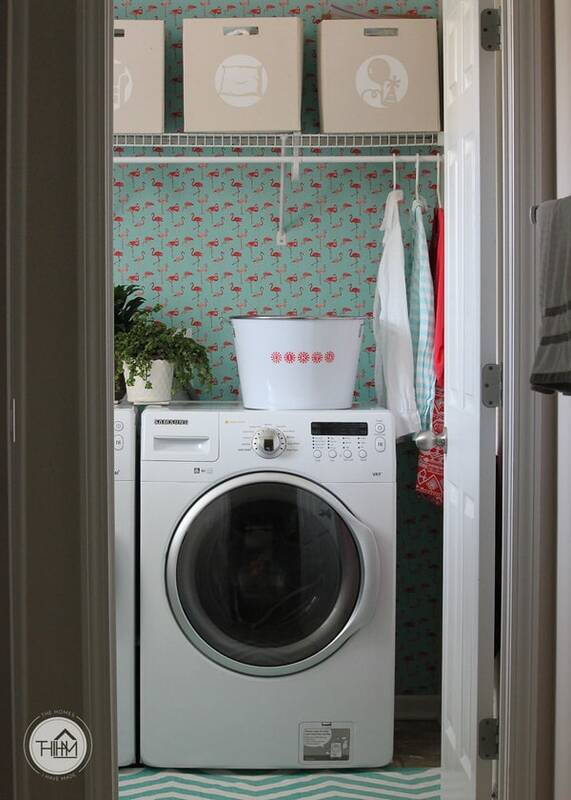 My husband’s not a huge fan of pink, so the laundry room was one of the most logical locations. And since the room sits somewhat out of the way, I thought it would be an awesome and fun backdrop to such a tiny and tucked back room. 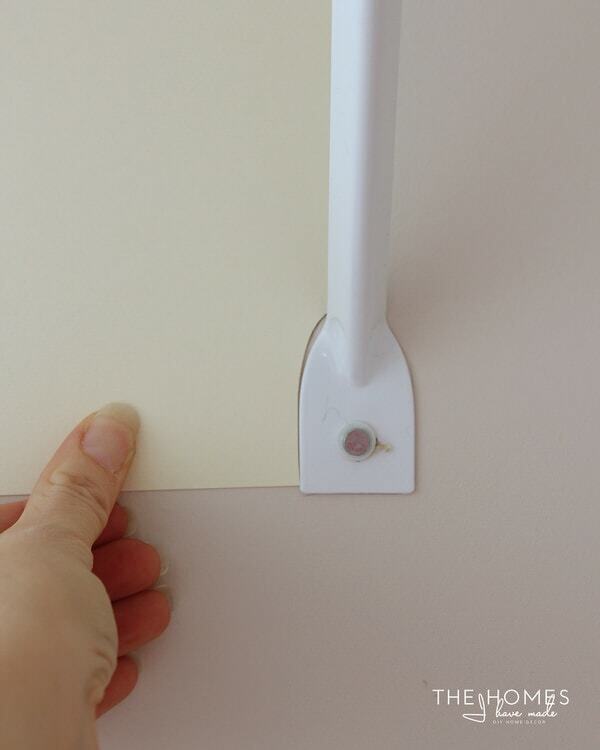 This paper job was made tricky by two situations 1) our laundry machines were already installed and too heavy to move and 2) the shelf was already affixed to the wall with anchors, so removing it to put up the paper (like I did in our last house) was out of the question. That said, I recommend starting with as much of a blank wall as you can. 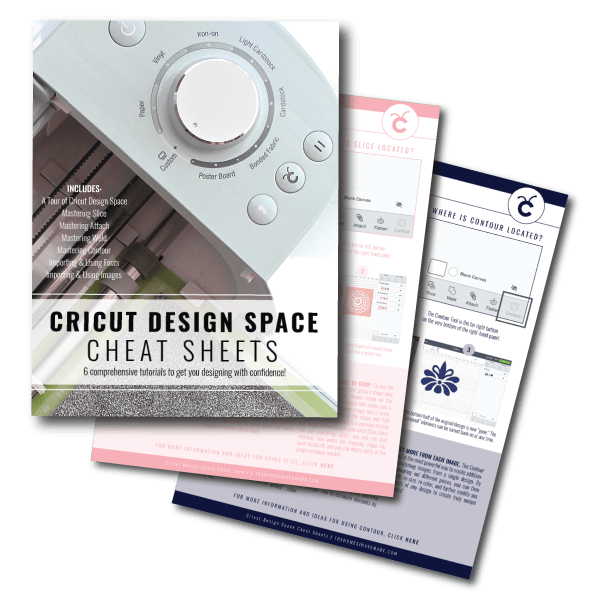 Remove any shelves, hooks, switch plates, etc before getting started. 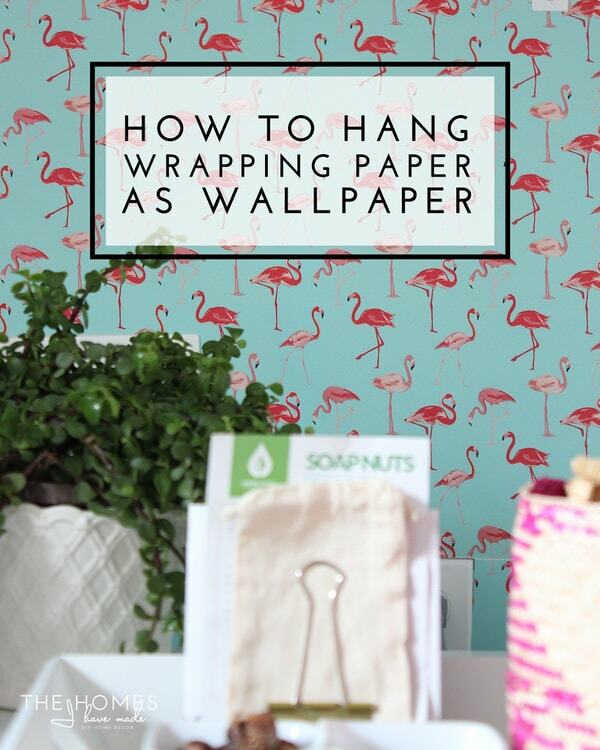 Next, look at your wrapping paper and decide how it should be hung. Some patterns can be hung either direction (and hanging vertically is much easier! 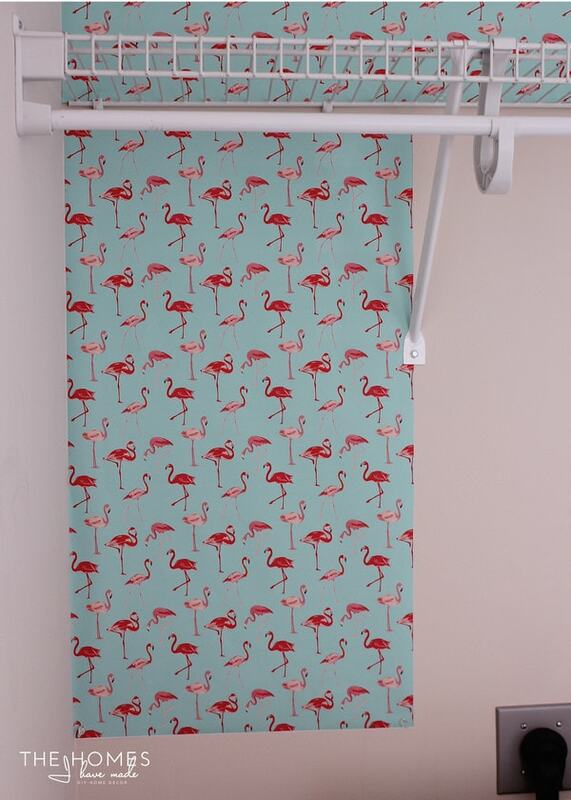 ), but these flamingos had to be installed horizontally if I wanted them right side up…which I did. I started by measuring the width of the back wall and the height from the ceiling and then trimming down the paper with a long ruler and rotary cutter. My original plan was to use thumbtacks in all the corners (a plan I had to abandon later on, I’ll tell you why). I was able to successfully use thumbtacks to hold the paper in place above the shelf. If you have a plain, flat wall, this is definitely a great option. The problems came in as I started to move below the shelf. As I mentioned, in our last house, I was able to unscrew these brackets, place the paper and then screw the brackets back in. These, unfortunately, were attached with anchors, and I had no intention of making even more work for us come move out time, so the brackets had to stay in place. After a lot of trial and error (and almost giving up!) trying to fit the paper around the brackets, I ultimately made a template out of cardstock to match the bracket dimensions, shape, and size. But as I stepped back and looked at it all come together, I was pleasantly surprised that not only could you not see the tape, but thanks to a lot of careful cutting and pattern matching, you really can’t tell see that instead of large cuts of paper, there are lots of smaller sections. All together, it looks clean and uniform! Phew! In the end, this paper is stabilized/anchored to the wall on the far outsides with thumbtacks and then pieced together and taped directly to the wall in the center with Scotch tape. 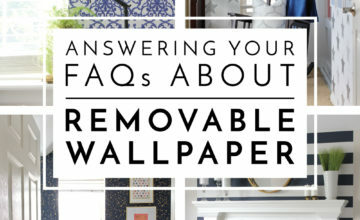 While the paper is not flush with the wall like a traditional wallpaper installation, its “bubbles” are hardly noticeable both in pictures and in real life! Buy more wrapping paper than you think you’ll need. 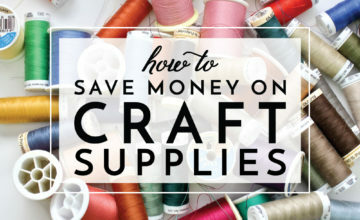 You can always return extra rolls, but matching patterns and mis-measuring can use up precious paper quicker than you realize! 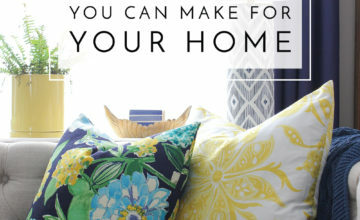 Marshalls/TJMaxx/HomeGoods has some of the NICEST paper for these kinds of projects. 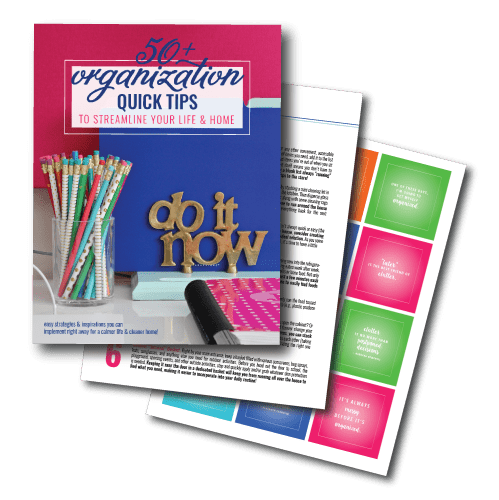 Their papers are usually nice and thick and have great colors and patterns. I do find that if the paper is really glossy, the seams, wrinkles and bubbles are more noticeable. I think partly why the seams are so well concealed in the laundry room is that the paper is “stone paper” which has a smooth, satin finish. Admittedly, double-stick tape is the easiest for installation (that’s what I used in our closet), but out of everything we had to “repair” and fix in our last house before moving out, removing all the double-stick tape from the closet was one of the worst. It’s not easy to peel up from walls, so proceed with double-stick tape with caution. 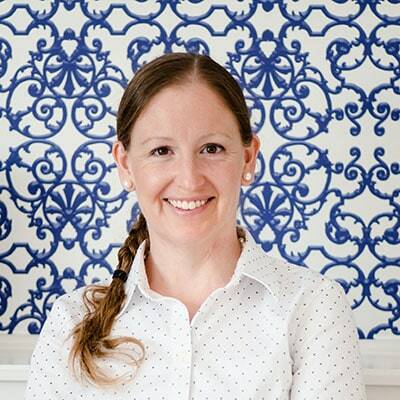 When selecting a space to wallpaper, I highly recommend a back of a closet, a feature wall, or a small wall that people won’t get up close to or see from different angles. As I mentioned above, the paper does not lay flat to the wall, so in certain lights or angles, the imperfections and waviness of the paper might be more noticeable. Work carefully. Compared to thicker wallpapers that I’ve worked with, wrapping paper is quite delicate and it wrinkles and tears easily. Work carefully, don’t tug at it too hard, and ask a friend for help if you can! Go for it! 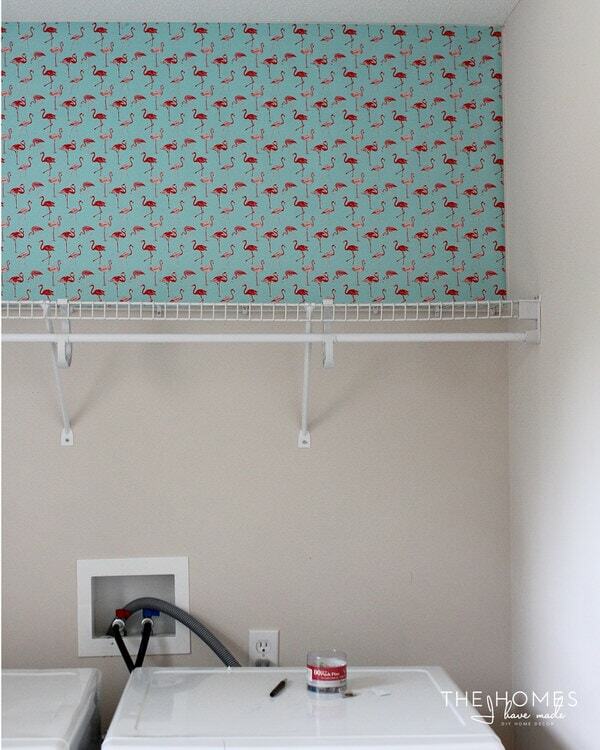 Wrapping paper is easy to find, relatively easy to install and super inexpensive. This paper will likely go right into the trash when we move out, but for a $10 investment, it is providing just the right amount of color and pattern we need in this space for the time we are here! 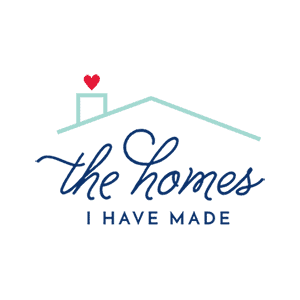 If you’re new around here or just catching up, I am sharing a renter-friendly wall project every month while we live in this home for a year. 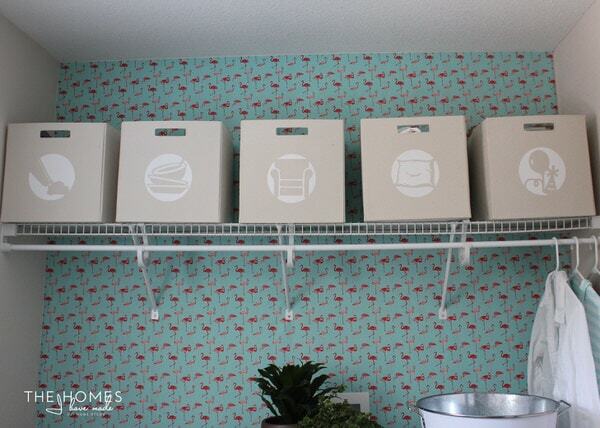 You can find my other temporary wall ideas HERE! 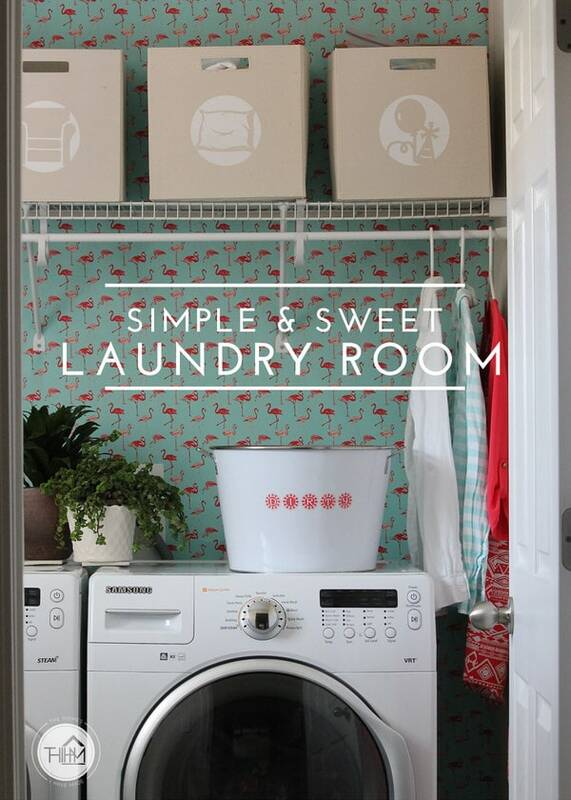 And if you missed the full laundry room reveal…click on the image below! I hope your week gets off to a great start! This post marks the end of laundry chat for a while. 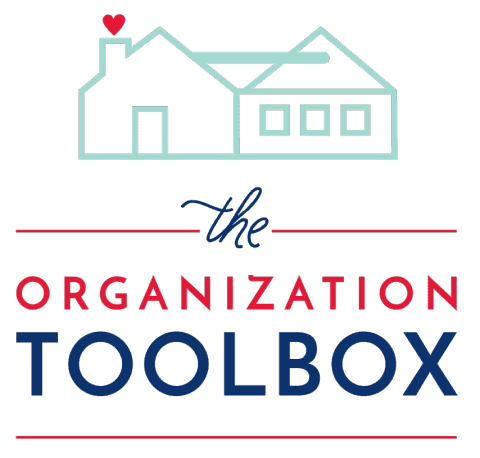 On Wednesday, I’m planning on giving you a glimpse into what we’ve accomplished outside! See you then!